“Know your customer.” You hear it everywhere. But what, specifically, does that mean? 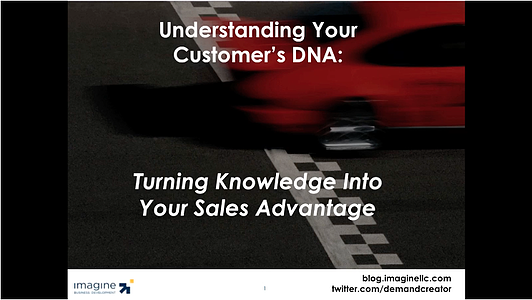 You need to know and understand your customer better than they know and understand themselves. It’s probably the single most important factor behind a company’s success. Think about it: are you fully taking advantage of the most important method to stand out and win? Adopt a strategy to approach your market in a way that plays up your strengths and appeals to potential customers. Play up your strengths in a way that helps you differentiate yourself within your market and stand out among the competition. Your greatest competitive advantage lies in knowing your customer. In this Webinar OnDemand, we'll give you the roadmap that will teach you how you can obtain this knowledge and then translate it into predictable, profitable revenue. Find out what you can do to create a stream of customers who are asking to do business with you... this is a webinar you don't want to miss!